The Academic Resource Center (ARC) is ready for you this fall! Please reach out to us with any questions you have and/or assistance you need personally or for your students. Not sure how the ARC can help you and your students? Our 10 Facts to Know about the Academic Resource Center is a quick-access guide to all the support it can offer. 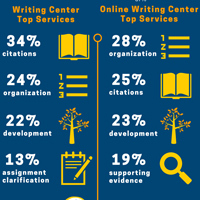 The Webster University community used the Academic Resource Center’s (ARC’s) Writing Center and Online Writing Center more than 2,000 times during the 2017-2018 academic year, with graduate students and undergraduate freshmen being the largest users, in part thanks to faculty recommendations about these services. The accompanying infographic highlights key usage statistics for the year. Students, faculty, staff, and the administration celebrated outstanding student writers at the Freshman Writing Award ceremony and luncheon. 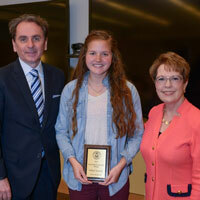 The first-place winner was freshman Cheyenne Davis for her essay, “Webster Groves: A Community of Gardeners." 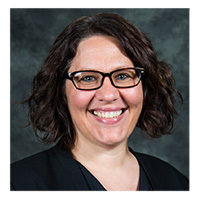 Anna Rickard received honorable mention for her essay “Recovery and Resistance: An Analysis of Survivors’ Role in Remastering Trauma.” This year winners were awarded educational grants to be used for textbooks or any academic expense of their choice. 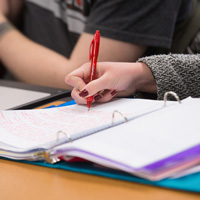 The Writing Center and Online Writing Center gives students, faculty, and staff feedback on essays, projects, theses, dissertations, and professional articles. 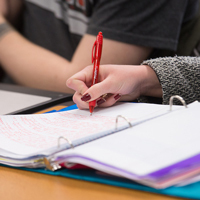 Students are encouraged to use the face-to-face Writing Center whenever possible for real-time feedback and discussion. Graduate students, online students, and students at extended and international campuses are encouraged to use the OWC for writing needs. English major Kaleb Gosdin was announced as the winner of the 2016-2017 Freshman Writing Award at a recent ceremony. Gosdin won for his essay, “Christianity and Sustainability” written for his First Year Seminar, Your Ecological Footprint. 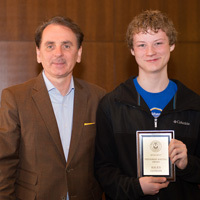 Gosdin was presented with his award by Provost Julian Schuster. Submissions are now being accepted for the annual Freshman Writing Award competition. Please consider nominating one or more of your student's papers for this award. Submissions must have been written for a class during the Fall 2016 semester, they may be in any genre, they must be a minimum of 500 words long, and they must be written in English. At the most stressful time of year for students, the library, writing, quant and counseling center at the Vienna campus offered a coordinated program to support students, staff and faculty as they wrapped up the semester. From writing tips to words of encouragement to therapy dogs, the services allowed community members to stay focused, make room for total wellness, and finish the academic year on a high note. The 2015-16 Freshman Writing Award ceremony was held April 8, 2016. Anna Grobelny won first prize for her essay entitled “How the Outside World Shapes Our Own,” written for Julie Setele’s sociology class; Mariah Pugliese won second prize for her essay, “Parsifal and Adolf Hitler,” written for Joshua Burel’s First Year Seminar course. 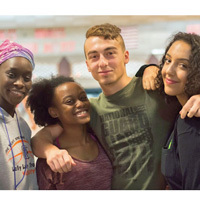 The Summer TAP Program brought new students to campus to help orient them to Webster's programs and services and prepare them for the transition to college.